Metals-Piping sources alloy steel seamless pipes from one of China’s eminent pipe mill – “CHENGDE”. The raw material we mainly procure includes ASME SA335 P11, P12, P22, P5, P91, P92; ASTM A333; 15Mo3, 16Mo3, etc. 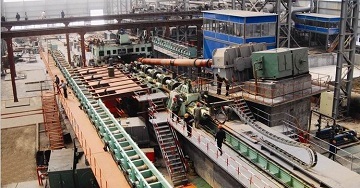 The largest production line for seamless steel pipes in the world. It can produce boiler pipes with maximum wall thickness of 142 mm for the supercritical high-pressure steam pipelines and petrochemical industry.